During their Friday livestream, Beamdog announced that their Neverwinter Nights: Enhanced Edition will launch on Steam March 27. There are plenty of adventures to be had with our list of the PC’s very best RPGs. The company began sending out keys for a closed beta last month, and pre-order customers have been able to play development builds of their updated BioWare classic. And post launch, those pre-order players will still be able to participate in Neverwinter Nights’ “head start” program. Beamdog say they’ll be adding to the game in the form of Steam Workshop content and new story modules. 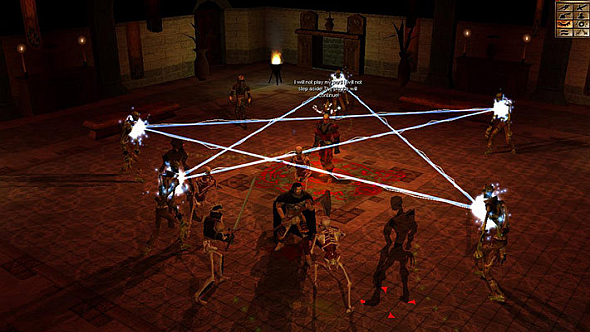 One of BioWare’s early classics, Neverwinter Nights came out in 2002 and was a leap forward from the 2D sprites and directed experiences of Infinity Engine games like Baldur’s Gate, giving players almost complete freedom in character creation. It also marked a massive step forward in its approach to user-created content, giving players the ability to look into the game’s modules and create their own. The Enhanced Edition updates the game for modern machines, supporting high-resolution visuals and HD screens. You’ll be able to buy Neverwinter Nights: Enhanced Editionon Steam, or you can pre-order from Beamdog’s store.